Want to do a speech? Write. Want to compose a book? Write. Want to produce a feature film? Write. Want to make a great podcast? Write. One of the most valuable things you can do for your career is build a writing habit. That’s why I made 30 Days to Better Writing. It’s a mini course designed to help you 10X your writing in just 30 days. Why you need to write. Where to use what you’ve written. Getting better at writing on purpose. Writing is the one skill that will transform your entire career. Writing will position you as an authority. If you can build a writing habit, you can teach people. Everything has been said before, but it hasn’t been said by you. Write to make room for new ideas. All you have to know to teach is more than any one other person. If you’re going to document processes, you might as well share them. When you develop your hybrid voice, you’ll simultaneously improve your writing and your speaking. There’s never a better time to start writing than today. 03:23 Sean: I wrote the Overlap book in July of 2016. Back in 2015, I said, “I’m taking off a month. I’m going to write the book,” and I did it. I wrote 5,000 to 8,000 words a day for a couple weeks, and I knocked it out. The big reason I did it is because I set aside the time, I told the team, I told the audience, and I was journaling every single day. 03:44 I was live-streaming the process of writing the book every single day. All of that is at OverlapBook.com, so if you never saw that, there are live-stream video recordings and journal entries of the process of writing the book. Really interesting stuff. 03:59 Ben: Writing 5,000 to 8,000 words a day wasn’t enough. 04:03 Sean: Right. Write, that was all I did. I just wrote. I wrote the Overlap book in a month because I had accountability. Lately, I’ve been thinking that I haven’t been reading enough. I have wanted to read more, and I keep buying books. There’s a stack on my table by the bed. It’s getting taller and taller. Laci said no, it looks bad. It’s this precarious tower of books, not neatly stacked. 05:03 It never happened. You know what I did? I kept buying more books. That was the problem. I needed the motivation. If I bought books, I would have to read them, right? It didn’t work. They were physical books, so I got an Audible subscription to listen to books. That could help me, right? 05:25 Ben: Yeah, when you go running, you can listen to books. 05:29 Sean: Wouldn’t you know it? Audio books, too, can collect dust. True story. I found out. I was not reading. I was not waking up early. I wasn’t running. I got out of the habit. I wanted to get back in the habit of running and reading, and I knew the only way I could build those habits again was with accountability. 05:46 I talked to Aaron Dowd, and he has agreed, every morning at 6am, to do a call. He says, “Alright, when did you wake up?” I’m trying to wake up at 4:30am, go for a walk or a run, something physical, and listen to audio books during that time. I start my writing and my work by 6am, call Aaron, and I tell him how it went. The other thing I’m doing is I’m setting aside an hour a day to read. I don’t have an hour a day to read. I work until 9pm or 10pm. I do that all the time. Why do I do that all the time? 06:26 Ben: Because the work you’re doing is important and you believe in it? 06:31 Sean: Those are better stories than the books I didn’t read. No, I tell myself those things, but the reason I work is because I let myself work. I can work until 9pm or 10pm, and so I do. There was no constraint. Everything takes as long as the amount of time you give it. Today’s show is about writing, but reading helps you improve your writing. This is relevant. 07:07 Sean: I have to set aside time, so I said, “I’m going to stop my work at 5pm, and from 5pm to 6pm, I’m going to read a physical book.” In the morning, I run or walk and listen to books on Audible. In the evening, I read any one of the books in my physical book stack that I haven’t gotten to yet. I’ve started doing this, and it’s really difficult, because it feels like I’m just wasting time. 07:31 I should be working. There’s too much work to do. But if Bill Gates can read for an hour or two a day, then I can read every day. The only way it’s going to happen is if I set aside time. It sounds obvious, but I needed to hear this myself. Maybe you need to hear this. You’re only ever going to read books if you set aside the time to do it. 07:56 Honestly, it has been really good. I’ve been really happy. In the morning, Aaron goes, “How did your reading go last night?” I’m staying accountable and sharing it. It creates this built in urgency for my day. I have to get my work done by 5pm. It’s just as if you had an evening meeting or a dinner with friends. You have to leave. You have to be done with work by 5pm or whenever you have that dinner. 08:18 It’s the same thing. Every day, I have to get my work done, so it makes me waste less time. Believe it or not, I waste a ton of time. I do get a lot done, but I also have RescueTime on my computer, tracking my time usage. It shows me that I’m wasting time. Not a terrible amount, but I’m still wasting time. I’m feeling good. I’m feeling productive. Without fail, it happens when I’m waking up early. Every single time. Find the habit that is going to be the most effective for creating a domino effect for each of the other positive habits you want in your life. 10:12 Sean: That’s a great point, because I have already done all of these things. I’ve just fallen off at varying stages. For me, it’s not like trying to create four new habits, even though it sounds like it. Believe it or not, that’s not the topic of our show, but I thought that was really important. We were going to have a really punchy show. Maybe we still will. We’ve got a great show for you. 10:44 Sean: One of the most valuable things you can do for your career is build a writing habit. Writing is the starting point for all other mediums. We’ve talked about writing a lot (Related: e039 It All Starts With Writing). 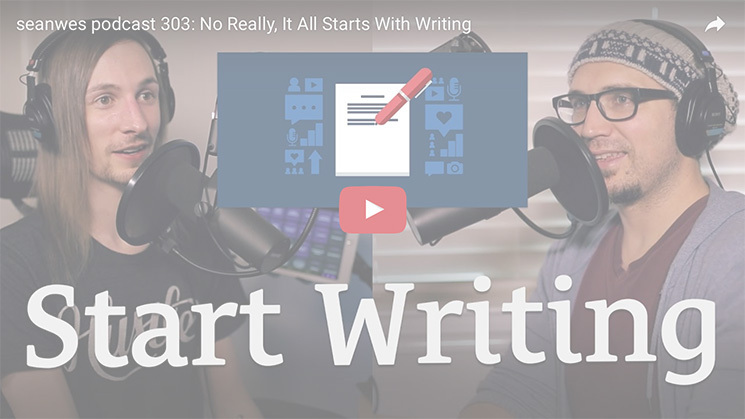 The last episode we did specifically on this topic was almost exactly two years ago at the very beginning of 2015, and it was called It All Starts With Writing (Again). 11:11 100 episodes prior, back in 2014, I did an episode called It All Starts With Writing. I keep revisiting this topic because it’s super, super important. 11:26 It will transform your business. It will transform your life, if you can get this habit. That’s why I keep coming back to it. If you want to do a speech, write. If you want to sell products, write. If you want to record a song, write. If you want to compose a book, write. If you want to produce a feature film, write. Make great podcasts? Write. Teach an online course? Write. Shoot a compelling video? Write. 11:50 It all starts with writing. One of the most valuable things you can do is build this writing habit. That’s a really tough thing to do. It’s hard to keep up the momentum with that, but that’s why we created this program called 30 Days to Better Writing. We release this to our members. 12:07 You hear us talk about the Community a lot, you hear us talk about seanwes membership. 30DaystoBetterWriting.com—you can go there now. We just launched this course publicly. You can enroll in the course there. You could also join and become a member and get access for free. This is 30 days, 30 lessons, 30 minutes a day. You basically spend a few minutes reading a lesson, you get a writing prompt, you write for 20 minutes, and at the end of the 30 days, you have this really strong writing habit. 12:41 You basically don’t have to think. Every single day, we’re walking you through. We’re helping you build out your editorial calendar, coming up with topics, writing better, writing more concisely if you struggle with rambling a lot, and what to do if you struggle with not having enough to say. All of that stuff is accounted for. We wanted to let you know about that. 13:38 Sean: I wanted to tell people about seanwes conference. I know it’s a bunch of stuff, but I’m excited. 13:43 Ben: I’m excited, too. I saw what you put in the Community earlier. 13:49 Sean: They saw things a little earlier. I’m really excited, though. We’re close to announcing a legendary speaker lineup for 2017. If you’ve been thinking that you’ve wanted to go, you’ve been planning to go, or last year you said you’d go next year, now is the time. This is happening in September, and it is coming fast. When we announce the speaker lineup, this event will sell out. 14:31 Those of you who are dead set on going, who wanted to go, you planned on it last year, you said you would this year… now is the time to register. I mean today. You’re listening live? Register today at seanwes.com/conference. What we didn’t do last year was go all out on promotion. We were just like, “Oh, the people in the Community will probably come, and it will be a great conference,” and it was. 14:59 This year, we’re going all out on promotion. I don’t even think we need to. Once people see who’s going to be speaking there, this event will sell itself. It will sell out, and you will not get to go, because you didn’t register when you heard it the first time. I just wanted to put that out there. I’m very excited. If you want to procrastinate, wait, and see what you’re going to miss out on, we’re going to be revealing all of the speakers in the coming weeks. Stay tuned for that. 15:40 Sean: Writing will help you make a name for yourself. Writing will position you as an authority. Writing will help you build community. We’re going to do another show called CommunityTalk. It’s an interview show, and it’s about building communities. We’re going to have other people who are community organizers, membership site owners. I’ve already started recording interviews. I’m very excited. 16:02 That’s just a teaser. Build community! Everything starts with writing. If you can build a writing habit, you can teach people. You can share what you know. It’s going to build trust. It’s going to help you get clients. It’s going to help you get customers. There are so many reasons to write. 16:40 If you’re listening to this because you know you need to start writing but you’re not motivated, I’m going to motivate you. By the end of this episode, you’re going to be motivated to build a writing habit. 16:54 Ben: If you don’t have a writing habit for your business, there’s a ceiling on what you’re capable of producing. Even if you write just to get clients, maybe you do a blog, and you wouldn’t call yourself a habitual writer but you write this blog, put this article out there, or write sales copy for your website here and there, I wouldn’t necessarily define that as a writing habit. There’s a difference between producing something as needed and using writing as a tool for deepening clarity and building volumes of information you can repurpose to go beyond you. 17:46 I was talking about this earlier in the pre-show. I wanted to reiterate it. It has this multiplying effect. When you don’t have a writing habit for your business, there’s a ceiling on what you’re able to produce. When you have a writing habit, the ceiling on what you’re able to produce goes away because you’re now taking what you know and can articulate and you’re spreading that out. 18:10 Sean: Writing is the fuel for all other mediums. You need to picture writing as a red plastic gasoline can with the yellow nozzle coming out. That is writing. It’s fuel. You can pour this into anything. You can pour it into a lawn mower, a car, a generator… It’s the fuel for any other medium, anything you want to do. The beautiful thing is, once you start putting into place processes—you bring on team members, you hire contractors, you build out automation systems and sales funnels—writing, moving your fingers, putting words on a page, speaking words, dictating them and seeing them appear, that is the fuel. 19:12 Sean: That is what becomes everything else. It’s amazing, Ben. I can write something. I can even be on my phone. I’ll open up the Notes app. So many of you are like, “What’s the best writing app? I need to figure out my setup.” It doesn’t matter. You can write on paper if you want. Eventually, you’ll probably want to put it on the computer, so I like to start there. Start with your phone. 19:36 I have a waterproof notepad in my shower. It’s called AquaNotes. It’s great. I love it. I need something all the time that can capture my ideas, just a few bullets. I’ll open up the notes app and I’ll type a bullet. For those that don’t know, you can put an asterisk and a space, and it will create a bullet in your Notes app. Here’s a hot tip. 20:00 If you’re on your desktop in the Notes app, we’re talking about the Mac ecosystem, command ] will create an indented bullet. A lot of people know this, some people don’t. Here’s the one that almost nobody knows. On iOS, the Notes app there, you can also create indented bullets. You place your cursor on the bullet and then you tap once. You know how it comes up with the paste, bold, copy, and all of that? 20:33 There will also be a right arrow on that little black popup. You want to tap that right arrow. You’re going to get even more options, one of which is indent right. You can even create nested bullets, right there on your phone. Use the tools you have to capture your ideas and create hierarchies and structures. 20:55 One of the things I teach in 30 Days to Better Writing is to first create an outline. What are the steps to achieving the end result? You want to start with the end in mind and then work backwards. Reverse-engineer it. Break down the steps. Why are you writing this blog post? Why are you creating this video course? What is the end result? What is the desired outcome? 21:15 Start with that, because you want to provide value. You want there to be a purpose and a reason for this. Now, work backwards. What are the steps someone needs to take to get to where they want to be? You’ve got maybe five, six, ten steps. Each of those steps can become an individual piece of content. Okay, let’s break down this one step. Create more bullets. 21:37 For each bullet you create, write a few sentences or maybe a couple of paragraphs. Eventually, you’ve got this beautiful outline, this beautiful draft. Maybe it’s a blog post at first, but it can also become a podcast. It can become a conference talk. All of this could start from your thumbs, on your iPhone. You type some bullets. You’ve got just a couple little pieces of an outline and you flesh that out. You expand it later. It can become all these other things. You will have a clear mind. You will become a better speaker. You will become more articulate. You will be able to teach others. You will be seen as an authority. You will make a name for yourself. You will build an audience. You will become a great storyteller. You will be able to sell products. You will be able to build community. You will get more ideas every day. 22:23 Story telling is powerful. It can be used in so many ways to get people on board with what you’re about. Do you have a lot of ideas? Do you know people in your life who seem to be overflowing with ideas all the time? Do you know why? How are they able to do that? They get the old ideas out. You’ve got all these cobwebs up there. It’s old and crusty. You’ve got ideas you haven’t acted on in 20 years. Write down your ideas to get them out of your head, do that every single day, and you’ll make room for new ideas. 23:00 Ben: Rachel carries around a pocket zipper thing that’s filled with index cards. She writes down all of her ideas on those index cards. It’s a little bit scary. If you go over to her desk/work area, she likes to write them all down by hand, so it’s almost like A Beautiful Mind. There are stacks and stacks. What you’re saying is true. 23:29 It’s this constant flow. When you write and you put your idea down, you’re taking the stopper out of the idea generator. People place a disproportionate value on an idea vs. the execution of that idea. A great idea plus great execution is what really provides the most value. You can’t get to the great ideas if you get stuck on a single idea because you’re not allowing them to churn through. You have to take that stopper out. 24:07 Sean: While we’re on that note, Derek Sivers has talked about Ideas as Multipliers. On that note, without execution, there is no value in the idea. People think ideas are valuable, but really, it’s the execution. You can say, “I’ve got this great idea. It will be a revolutionary new phone.” That’s great. Everyone tries to do that. What matters isn’t your ideas, it’s how you execute on those ideas. 25:30 I would say a billion. I really like that, ideas being multipliers. There are a bunch of reasons why you should write. 26:43 Sean: The thing is, people think they don’t have the right kind of insight. They think they’re not knowledgeable enough. They think they don’t have anything to say. 27:00 It’s the act of writing that brings forth your message. You have to write to figure out what you have to say. When you’re sitting around waiting for the idea, waiting for something to say before you write, it’s never going to come. That’s not how it works. You have to act first. The more you write, the more you find you have to say. I’ve said it a bunch of times, but I didn’t start this podcast with 303 episodes in my mind. 27:30 That’s not the reason we’re repeating today’s topic. We’re repeating it because it’s important. It’s the showing up. It’s the consistent writing, podcasting, and putting out of your voice that makes room for new things. When you do that, you’ll find that you have so many other things to say. 27:52 Ben: We can’t park on this too long, but it was Benjamin Franklin or somebody like that who said, “I write when I have inspiration. Fortunately, inspiration strikes at X time every single day.” It’s a combination of believing that you will find your voice as you write and actually making the time for it, actually setting aside the time. 28:25 Sean: Inspiration strikes at 9am, or whenever he starts writing. “It’s already been said before.” That’s another reason people don’t write. 28:41 There’s nothing new under the sun, except you! Your unique perspectives, upbringing, context, voice… these are all valuable things. The way you say something, how you approach it, the way you deliver it, is going to resonate with people in a different way than others. Even if someone else has said it before, maybe they said it in a way that doesn’t resonate with someone because of their style or their background. When you say it, it can click for someone, and that’s creating value. 29:11 Ben: What if Martin Luther King Jr. had said, “Well, all the things I want to say have already been said before”? 29:16 Sean: What if he said, “Someone else already had a dream”? 29:29 Sean: You just start. That’s honestly the real answer. I know you won’t be satisfied with it, so I’ll break it down a little bit, but the answer is that you just start. You can’t edit what you haven’t written before. The best writers edit. Everyone edits. You have to get out the raw material. Shovel in the clay to create the sculpture. You don’t start with the finished product. You have to develop it out of the raw materials. 29:56 The raw materials are words. You have to get the words out onto the page, whether that’s writing, speaking and dictating, or transcribing. Get the raw materials out. Ramble. It’s perfectly okay to ramble. I’m going to bring in a question that’s related to this, because someone was asking about it. 30:17 It was Derek, he said, “When writing on a particular topic—do you think it’s better to just free write or ‘stream of consciousness’ write to ‘get it all out’ and organize it later—or is it worth it to create some sort of framework for points you’d like to tackle? For example, breaking a 1hr writing session in to 3 or more parts?” Lesson 14 of 30 Days to Better Writing is on the topic of rambling vs. elaborating. 30:45 We all have different styles. Some of us naturally tend to ramble. We have a lot to say. Maybe it’s not exactly the way we want to say it. The thing that’s going for you there is that you’re automatically creating the raw material you need, which is words. Others of us, like myself, we don’t typically talk when we don’t have something to say in exactly the way we want to say it. 31:11 That’s nice, because we can be concise. Brevity is useful. It’s not so great when you’re trying to write something. You’ve written two sentences and it’s not very compelling. That’s the problem. It depends on the type you are. If you’re a rambler, get the raw material out, look through it to find your point, and restructure your words to lead your reader to the conclusion you want. 31:39 Ben: That feels like an extra step. “So you’re saying that I have to write all this stuff out, get it out of my brain, and then I have to go back and take it piece by piece, rewrite it, and edit it?” That is actually the most efficient way for people who write and think that way. That’s the most efficient way to get your thoughts out, because doing it the other way, editing as you go, is painstakingly slow. It often leaves you with a less good finished piece. 32:15 Sean: Those of us who have a hard time getting a bunch of words out, that’s where I like to use the whole steps thing I was talking about earlier—creating the outline. Start with the end result. What are the steps required to get from where you are to where you want to be? Then break down the steps. Ask yourself questions about the steps. 32:35 How does this really work? What does it look like? How would you detail the process? What if things go wrong? Answering questions you’ve asked yourself is a great way to come up with more words. Put yourself in the reader’s shoes and ask yourself questions as the author. “What if this happens? Can I do this if I’m a beginner? Is there anything required before this step?” Ask yourself questions and then answer them. You can just remove the question from your draft, but now you have more material to work with. 33:28 The main thing is, teach what you know. We all know things. If you’re listening to this podcast, you know how to listen to a podcast. Everyone knows how to do something. You know how to drive. You know how to do something that got you hired for your job. “Sean, I don’t have a job right now.” Don’t get fancy with me. You know how to do something! 33:52 Think about your situation and how you got here. Do you dress yourself well? How did you do that? You can teach people that. You know things. You don’t have to be a master to teach people. All you have to know to teach is more than any one other person. That’s it. Teach what you know. 34:20 Share what you learn as you go. Iterate in public. Share your process. How do you do your work? What is your process? You don’t have a process if it’s not written down. We’ve been writing down processes. Actually, Kyle is in the room with us. He’s running the cameras for us. Cory couldn’t make it today, so Kyle came in. The reason Kyle is able to run the cameras for us is because I had Cory write down, exhaustively, step by step, his process. 35:10 Kyle: He wrote such a good process, by the way. 35:14 Sean: He sent it to you. You were telling me that it was so thorough, so detailed, just step by step. 35:19 Kyle: Yeah, step by step. Literally everything I needed to do to get this set up. It was super easy because he wrote it, and he also made a video based on the thing he wrote. You don’t have a process unless you’ve written it down. 35:36 Sean: If you’re going to write it down anyway, why not share it with people? They can benefit from it. It positions you as an expert. 35:41 Ben: I like that, too. If you know you’re going to share it with people, you’re much more thoughtful about the words you use to describe the process. We did an exercise in elementary school where we had to write down the steps for making a peanut butter and jelly sandwich. 36:01 Sean: I did that as a kid! It felt absurd, right? 36:06 Ben: We all did it, and then the teacher started reading it and started asking these ridiculous questions, like, “Where are the knives? Where is the peanut butter? How do I open the peanut butter?” Writing down your process in terms of sharing it publicly, you have to think, “Who’s on the other end of this and what do they need to know?” It helps you get into those really important details that you might not otherwise share. 36:37 Sean: I remember that peanut butter and jelly process. Step by step, you had to write it down. It sounded so dumb. “Spread the jelly on the bread.” I can’t remember if I imagined this or if the teacher replayed our instructions and started spreading it on the plastic of the bread bag because we didn’t specify that you’re supposed to take the bread out of the bag and put it on a plate. 37:07 Sean: I wrote out a book summary for The E-Myth Revisited. I haven’t actually read the book, but I went through some video recaps, multiples of them. I wrote it all out and compiled a transcript, a bulleted list. I was trying to learn fast. I wrote this for myself, but I thought, “I might as well share this with people.” Go look at this book summery and expand that first message, and there’s a ton in here. 38:08 This is something we’ve been placing a great deal of emphasis on inside seanwes. We’re in the process of creating processes for everything that we do. It gets even more meta. Something on my To Do list is creating a process for creating processes. 38:27 Sean: Anyway, if you’re going to document processes, you might as well share it. Talk about your tools, interview leaders, case studies, tell a story, curate resources, and review products. There are a lot of things. Once you’ve written, you’ve gotten over the initial hurdles and you’ve figured out how to start, you’ve gone off of what we’ve provided here, you know what to write, now where do you use it? 39:21 You can use it in blog posts, newsletters, podcasts, videos, courses, speeches, or if you want to write a book. I hope I’m giving you ideas here, as you’re listening to this, of things you can do and things that writing enables you to do and why you want to build that writing habit. 40:06 Sean: Hopefully, I’ve sounded fairly natural. You could probably tell a few places where I was reading from my outline—certainly the bullets—but a lot of things in this show are things I’ve said before, things I’ve written down in the outline, and I was actually reading. The reason it sounds seamless is because I’ve developed what I would call a hybrid voice. 40:25 A hybrid voice is where you can read what you’ve written and it sounds completely like your natural speaking. What’s also cool, a secondary benefit, is that when you speak naturally, if you were to transcribe every single word you spoke into written form, it would look as if you wrote it. It’s interchangeable. That’s a beautiful place to arrive, but it doesn’t happen automatically. You create a hybrid voice when you’re purposefully auditing your process. 41:22 Number one, you write something out. Attempt to write like you talk, but write out a phrase and memorize this. Memorize a sentence or two. Memorize it generally. Don’t memorize it word for word, but memorize the point you’re trying to convey. You’re looking at your script. You’ve printed it on a piece of paper or it’s on your phone, and you’re like, “Okay, I’ve got the general idea.” You set it to the side. 41:46 You’re not looking at the script at all. Now, turn on a recording device. Use your phone, use a camera, it doesn’t matter. Recount that from memory. Say the thing you memorized, say the point of it, as if you’re saying it to a friend or a younger brother/sister/cousin/nephew. Say it as if you’re explaining it to someone else, preferably someone like a younger sibling, because you’ll tend to be more clear. 42:15 That’s always a really good thing. What you’ll also do is you’ll infuse your natural speaking voice into this message. You’re going to speak it as you normally would. You wouldn’t speak it in a way that is written super formally and feels stuffy. The next thing you do is you listen back to this recording of your voice and transcribe every single word. You could play it back at half speed, if you want. 42:41 Make it a little easier for yourself. Transcribe every word you say, even the filler words, the “ums” and “ahs.” Look at it. It’s really, really interesting to see the words that you spoke written out exactly as you spoke them. You’re going to find that there are some discrepancies. For most people, there are differences between the way you speak naturally and the way you write. 43:10 What you want to do is rewrite your message and remove the parts that are not authentic—the filler words, the things you don’t want to say—but keep the natural pieces of it, the part that sounds like you and the way that you talk. Keep that part. Rewrite that message and then repeat this. Repeat this exercise. You could do this literal exercise, or a good way to make progress in your content output is to do this with pieces you’re already putting out. 43:43 Are you already podcasting? Are you already making videos? Are you already blogging? Why don’t you make an audio recording of your blog? When you start to read it, maybe you find, “You know, the way I wrote this doesn’t sound very natural.” You’re going to audit your process that way, and eventually, over time, you’ll develop a hybrid voice. 44:05 Ben: It doesn’t just benefit your writing, but it’s incredible how it brings the natural pieces of your normal speaking into your writing. That adds a ton of authenticity. It will also make it a lot easier for you to articulate anything about your business, your vision, or your mission when you’re talking with people one-on-one or having conversations with a potential client. It’s going to benefit all those interactions because you’re going to have this new hybrid of the formal, structured language you use when you write and the more natural speaking voice that you have. The combination of those two is going to make it a lot easier for you to speak clearly. 44:59 Sean: You’ll become a better speaker, podcaster, and communicator in person. There are all kinds of benefits. 45:04 Ben: I also like the part where you’re listening back to it, because you get to hear the authenticity in your voice. We’re not very good at listening to ourselves. If you were to read it out loud from the paper, you’re probably not as aware of how formal you sound as you are when you’re just passively listening and really taking that in. That’s a really interesting step. 45:48 Sean: We’re just scratching the surface, and if this is something you really are serious about and you know that you want to develop a writing habit, go to 30DaystoBetterWriting.com and enroll in this course. It’s 30 days, 30 lessons, 30 minutes a day. It’s super simple. It’s also a great time to become a seanwes member, because members get access to this course for free. That’s yet one more reason to become a member, in addition to all the other benefits—listening live, access to the Community, the Vault, all 500 plus episodes on the seanwes network. 46:21 There are a lot of benefits there. Check out the course. I think you’re going to like it. The members have collectively written millions of words. They’re going through it all together right now, which is really cool to see. They’re sharing their progress, which is a lot of fun. Let’s get into questions here. 47:04 Honestly, I think the answer is that you should be doing all of it together. I think writing exercises are good, and you can do them on their own, but as much as possible, I would apply them to the writing you’re already doing for something. 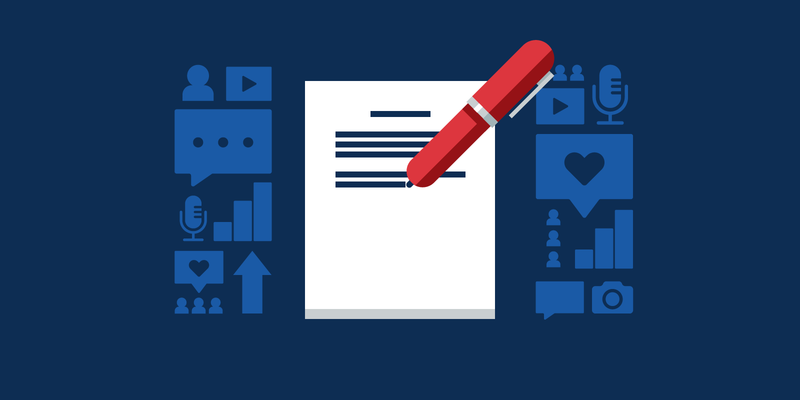 Do you have a newsletter or a blog? Are you doing videos? Do you script your videos? Are you preparing them? If not, you can use writing to make those more intentional. Apply your writing exercises to things you’re already doing. 47:32 Ben: Just to clarify, there are prompts in 30 Days to Better Writing, but don’t feel like you have to stick with what that topic is. You can apply that lesson or take that day’s writing and put it towards something you’re already producing. 47:54 Sean: Karin says, “I remember that you were recommending to have a topic day (for topic finding and outlining). Is a writing day recommendable (e.g. writing 6 blogs for the next week/s)?” You pick a day out of the week, maybe it’s Mondays, when you come up with topics for the rest of the week. I think you should write every day. You shouldn’t have a writing day, you should write on all the days. 48:23 Ben: If you’re in beast mode and you’re writing for several different mediums and you want to have a blog day, go for it, but don’t batch all of your writing on one day. If you’re going to batch, batch for a specific medium. That’s really good, because you’re in that zone. 48:47 Sean: Darian says, “What are the best ways to gauge if I’m actually getting better at writing? I write for two blogs and it seems like 1 in 10 blog articles is a hit and the rest are duds.” That’s normal. That’s great. Keep going. The way you know you’re getting better is if people are still engaging. If you’re not improving or doing great, people aren’t going to be engaging. If people are sharing, reading, visiting, commenting, replying, or liking, those are all good indications. 49:23 One out of ten does really well? That’s awesome. Keep going. Here’s the fiery one you were waiting for—how to internalize the benefits of writing. He wants to know, “I know, Sean, you’re trying to get me to be on fire for writing, but how do I internalize the benefits of writing to motivate me to build a writing habit?” Sebastian, you have all the rest of your life ahead of you. It can go really well, you can meet a bunch of people, and people can get a bunch of value out of what you have to say and share, your experience. 50:05 You feel like you don’t have experience right now. You’re young, you don’t have a lot to say, you haven’t done it before, and you feel like other people are smarter than you. It’s like Gary Vaynerchuck talks about, document over creating. A lot of people get caught up with this idea that they’re supposed to create and make things, position themselves as an expert, and look like a professional. We put all this emphasis and energy on looking like someone who’s a big deal. Maybe we’re not yet. Maybe we haven’t done it before. In that case, err on the side of authenticity. If you haven’t done something before, don’t act or write like you’ve done something you haven’t. 50:50 Teach what you know. That’s what we say, teach everything you know. The implicit part is, don’t teach what you don’t know! Just teach what you know, and if you don’t know something, don’t talk about it. Document over create. Share as you go. Share the learning process. Sebastian, you’re learning code right now. Do you know that there’s a bunch of people in your position right now learning code? A bunch! 51:48 Ben: This is a true story. When we had our first baby and we ran into our first time of, “I have no idea what to do,” I called my dad up. He was no help at all. 52:06 Ben: It’s been years, decades since he’s had a baby. 52:08 Sean: It’s not recent. You have the curse of knowledge, the distance from the actual thing happening. Someone who’s in it, when they’re in it, the things they have to share about it are going to be extremely relatable. One of our Community members, Dave, just quit his job. He’s starting his own thing. He’s got money saved aside. He’s making the leap. There’s a conversation in the Community called Making the Leap, go check it out. 52:43 I encouraged him to share as he goes, every step and feeling that he’s experiencing. I said, “Keep us in the loop. Share it.” He’s leaving his job. He didn’t like his job. He wanted to leave it, but as he’s quitting and putting in his notice, he’s experiencing all these feelings and emotions. “It wasn’t that bad. I do miss some things. I am going to miss the people.” You feel this conflict. 53:14 He’s sharing this as he went through it, and just days later, he said, “I already feel better. I have clarity and I know why I’m doing this.” You forget about those little moments, those experiences, those emotions and feelings when you’re going through something, when you look back. You forget about it when you look back. When you’re not documenting as you go, you don’t have the track record to be able to relate to people. 53:40 I know I’m at a certain level, and maybe I’m not entirely able to relate to someone who’s at a different level, but I think I’m able to relate better given the fact that I’ve been documenting all along. I have all this stuff written, all these struggles that I probably never would have remembered if I didn’t have written documentation to revisit. 54:04 Ben: I want to circle back to answer this with something I said earlier. I think about those foundational pieces. You have to consume and learn things, and then you have to act on that knowledge in order to solidify that so it’s something you can share. A lot of people stop there. They learn a skill, they do that skill, and that’s how they produce value. 54:27 There’s a ceiling on that. Really, that only allows you to produce enough value to benefit yourself and maybe your family. It stops there. When you write, you can produce a ton more value in terms of money. Selling a book and selling a course, these things have a lot more financial upside than just keeping all that stuff to yourself. If you think about it in terms of the value you’re putting into the world, when you write, you’re transferring your experiences in your voice to other people who can then turn that into value. 55:13 It has this exponential effect. That potential is there. Wherever you are right now, whatever you know, whether you feel like a novice or an expert, you know something you can write and share. If there is potential for that value to spread the way that writing makes it possible, then you’re withholding value by not writing. Thinking about it that way, for me, puts the fire under my tail to actually make it a habit and get it done. I’m still working on it. I can’t say, today, that I have a writing habit, but that’s the belief that’s driving me. 56:02 Sean: Nathan Barry tells the story of Chris Coyier, who has CSS-Tricks. It’s all this stuff about CSS and development, and Nathan saw what Chris was doing, and he was like, “Okay, that’s cool. I already know all that stuff.” Every time Chris would make a new post about a new thing, Nathan gave himself a pat on the back and was like, “I already know that stuff. I’m a pro.” Over the years, Chris shared more and more. 56:31 He built up an audience of people from these things that he shared as he went. He built up this community of people, and he eventually got to the point where he was going to redesign his site, and he ran a Kickstarter that said, “I’m going to record the process of developing this new site and share it with you if you back this project,” and he raised $80,000. 57:15 Sebastian, you’re investing in your future. You can’t go back and write retroactively. You can’t go back three years and write what you didn’t write then with what you knew and how you thought then. You’re investing in your future. Maybe you can’t see the benefits of documenting the journey now, but if you believe that you will get a return, there’s never a better time to start than today. 58:22 The best time to plant a tree is 20 years ago. The second best time is today. Go plant a tree. Go write.